The biggest fixture on match day five in the Premier League will take place at Wembley between hosts Spurs and early pace setters Liverpool. 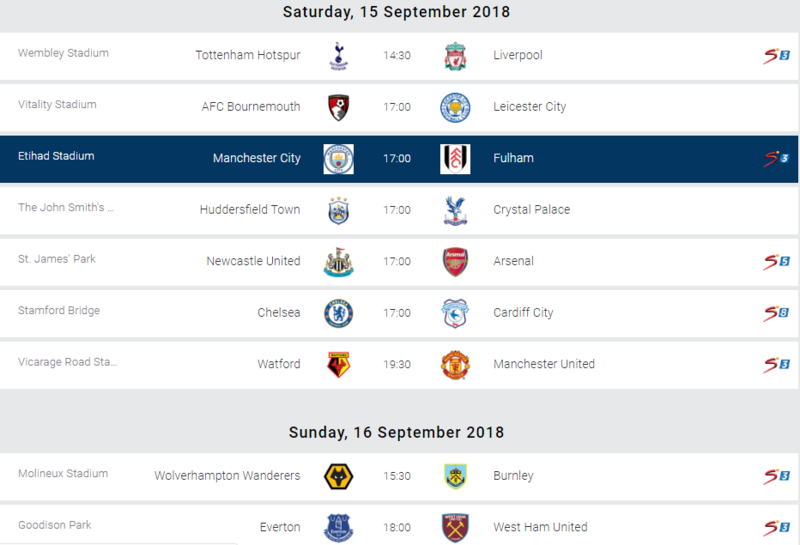 Maurico Pochettino’s charges lost their first game of the campaign before the international break and will be eager to make amends when a Liverpool side that has won all their opening four fixtures visist London. The hosts will be without midfielder Dele Alli because of the hamstring injury he sustained while playing for England last weekend. Captain, Hugo Lloris remains sidelined by a thigh problem but Son Heung-min is available after helping South Korea win gold at the Asian Games. For Liverpool, Adam Lallana will miss out with the groin strain that caused him to pull out of the England squad but reserve goalkeeper Simon Mignolet is fit after a hand injury. Tottenham’s solitary win in their 11 most recent Premier League games against Liverpool was a 4-1 victory at Wembley last season. The only time the Reds have failed to score in their last 12 league matches against Spurs was in Jurgen Klopp’s first game in charge back in October 2015. The 149 goals scored in Premier League matches between these sides is second only to the 151 goals in the Arsenal-Everton fixture. Bournemouth has seen their best start to a top flight season in decades, winning two and drawing one of their first four fixtures. They host a Leicester side that seats one place below them having won two and lost as many in their first four games. Bournemouth winger Ryan Fraser is a doubt after picking up a hamstring injury playing for Scotland. Charlie Daniels remains out with a knee problem while Junior Stanislas is back in training after a knee injury but won’t be ready for the weekend game. For Leicester, striker Jamie Vardy is available after a three-match ban and transfer deadline day signing Caglar Soyuncu is fit and ready to make his debut. Bournemouth are unbeaten in the six Premier League meetings to date, though five have been drawn. There have only been seven goals in those six matches, with neither side managing to score more than once in a single fixture. Leicester’s most recent win against Bournemouth came away in February 2014, with Kevin Phillips scoring the only goal in a Championship encounter. Maurizo Sarri’s Chelsea have had a perfect start to the season, winning all their first four games and seating second on the log with only an inferior goal difference as compared to leaders-Liverpool. Their visitors on Saturday-Cardiff are one of the five sides yet to win a game this season but will surely take pride in the two draws attained so far. Chelsea go into the game having won 10 of the past 12 league meetings with Cardiff, including both previous Premier League fixtures in 2013-14. Cardiff have lost four successive visits to Chelsea in all competitions since a 1-0 victory in the second tier back in April 1981. That is their only win in the last nine attempts at Stamford Bridge. Cardiff’s most recent victory against Chelsea was by 2-1 at home in the League Cup third round in October 1986. Chelsea’s Cesc Fabregas could make the bench but head coach Maurizio Sarri has hinted he might delay the Spaniard’s return from a knee injury. Fellow midfielder Ruben Loftus-Cheek is doubtful after picking up a shin injury on international duty with England. Cardiff City’s Josh Murphy and Aron Gunnarsson could feature after hamstring and knee injuries respectively. Winger Nathaniel Mendez-Laing is a long-term absentee with a knee injury. Huddersfield are again without captain Jonathan Hogg as he sits out the last match of a three-game suspension. Juninho Bacuna and Collin Quaner will be assessed after picking up minor knocks. For Palace, talisman Wilfried Zaha and centre-back James Tomkins both returned to training this week following injury and could be included. Christian Benteke is out due to a knee injury but new signings Max Meyer and Cheik Kouyate are pushing to play. The two clubs met three times last season in league and cup with Palace winning twice and Huddersfield once. The Eagles won last season’s corresponding fixture at the John Smith’s Stadium 2-0, with a goal from James Tomkins and a Luka Milivojevic penalty. Palace have won all three of their top-flight away games at Huddersfield, keeping a clean sheet on each trip. Reigning Champions City find themselves seated seated fourth on the log before the first kick of the ball this weekend. Pep’s team who are still unbeaten have won three of their opening four games-drawing 1-1 at Wolves on match day three. Their visitors Fulham have endured a mixed return to life in the top flight, winning one, drawing one and losing two of their first four games. Pep will be relieved that forward Raheem Sterling is fit to play after the back injury that saw him withdraw from England duty. Defender Danilo is back in training but is expected to remain on the sidelines, along with long-term absentees Kevin De Bruyne and Claudio Bravo. For the Londoners, they will be without midfielders Tom Cairney and Neeskens Kebano with foot and ankle injuries respectively. Defender Tim Ream also remains sidelined with a thigh problem. City have won the last five meetings, all in the Premier League. Fulham have lost their last three visits to the Etihad Stadium, failing to score while conceding 10 goals. Fulham’s last win at Manchester City was in 2009 when two goals from Clint Dempsey helped them come from behind to win 3-1. The London side have failed to keep a clean sheet in their last 20 league meetings with Manchester City. The frustration at St. James Park keeps on mounting as Rafa Benitez’s men have only a single point out of a possible 12 and occupy the third of three relegation spots. They next host an Arsenal side that has somehow won their last two fixtures despite losing the first two. Newcastle go into Saturday’s fixture having beaten Arsenal only two times in 23 meetings in all competitions (D5, L16). However, the Magpies won the last meeting 2-1 at home in April, and could win back-to-back league games against Arsenal for the first time since 1996. Their forward Salomon Rondon and defender DeAndre Yedlin could be rested after their late return from international duty. Midfielders Matt Ritchie and Jonjo Shelvey are back in training after respective thigh and knee injuries, and should feature. Arsenal boss Unai Emery has no new injury worries and could name the same side that beat Cardiff two weeks ago. Alex Iwobi is also in line for a return after missing that win through illness. What a start to the league Watford have made. Javi Garcia’s men find themselves in the top three having won all their first four games including a 2-1 comeback victory over Tottenham in their last game. However, their credentials will be put the maximum test when they host a United side that is desperately looking to accumulate points after losing two of their opening four fixtures. Manchester United left-back Luke Shaw could be involved after recovering from the head injury he sustained on international duty. Midfielder Marouane Fellaini will face a late fitness test while Ander Herrera has been ruled out with an ankle knock. Forward Marcus Rashford serves the first of a three-game suspension after his red card at Burnley. Watford head coach Javi Gracia is expected to name the same side that beat Spurs 2-1 before the international break. Winger Gerard Deulofeu remains out with a hip issue while Tom Cleverley is the only long-term absentee. Watford have lost 14 of their last 15 games in all competitions with Manchester United, winning the other one. However, the Hornets did beat United 3-1 at home in the Premier League in September 2016. Manchester United won this fixture 4-2 last season, with former Hornet Ashley Young scoring twice. Burnley have Johan Berg Gudmundsson back available for Sunday’s Premier League match, which Ben Gibson will sit out. Winger Gudmundsson has recovered after missing the 2-0 home loss to Manchester United last time out due to a hamstring problem. Gibson, who was also not part of the squad for that game, is to see a specialist about his groin issue. Fellow defender Stephen Ward is fit again after a foot injury saw him miss the Republic of Ireland’s match against Poland on Tuesday. Wolves could be without Raul Jimenez as the forward, who scored on the opening day of the season against Everton,sustained a muscle injury while away on international duty with Mexico. Portuguese winger Ivan Cavaleiro is yet to play this campaign due to a back problem and he will remain out. Wolves have won both of their previous Premier League meetings with Burnley, with Mick McCarthy’s side netting twice in each match in the 2009/10 season. Burnley are unbeaten in four league encounters with Wolves, winning two and drawing two. Wolves haven’t gone three consecutive home games in all competitions without winning against Burnley since April 1952 (D1 L1 currently). Burnley have never won a Premier League away game against newly promoted opposition (W0 D6 L4), including a 0-2 defeat vs Wolves at Molineux in December 2009. Everton’s injury crisis has eased with Theo Walcott, Idrissa Gana Gueye, Dominic Calvert-Lewin and Bernard all in contention. Defender Yerry Mina trained with the squad for the first time since his £28m summer move from Barcelona after recovering from a foot injury while midfielder James McCarthy has also returned after breaking his leg in January. Defender Seamus Coleman will be out for two weeks with a stress fracture of the foot and forward Richarlison serves the final match of his suspension while Phil Jagielka (knee), Andre Gomes (hamstring) and Michael Keane (head) are still absent. For the Hammers, Jack Wilshere will miss the trip after picking up an ankle problem in training. They will assess the former Arsenal star next week before determining how long he will be out of action. Striker Javier Hernandez has a virus so will also miss the Goodison Park clash, while Andy Carroll, Manuel Lanzini and Winston Reid remain long-term absentees. Everton have only lost two of their last 20 Premier League encounters with West Ham (W12 D6 L2), though both losses have arrived in the last five meetings. West Ham have won just one of their last 11 Premier League trips to Goodison Park (W1 D3 L7), winning 3-2 back in March 2016. Everton have won more Premier League matches (24) and scored more goals (80) against West Ham than they have versus any other team. West Ham have lost their first four league games in a season for only the second time in their history and first since 2010-11 when they were relegated. The Hammers have never lost their first five league games of a season. Saints manager Mark Hughes expects to have striking trio Charlie Austin, Shane Long and Danny Ings available to face Brighton. Austin (hamstring) and Long (toe) have been absent from training this week, while Ings has been suffering with a blister. Saints have no other selection concerns and could stick with the team which won at Palace before the international break. Meanwhile, Andone and Jose Izquierdo could make their first appearances of the season on Monday. Romania forward Andone has been sidelined with a groin problem, while Colombia winger Izquierdo has been building his fitness following his involvement in the World Cup. Chris Hughton has no selection concerns ahead of the trip to St Mary’s, with defenders Bruno and Lewis Dunk available following their recent injury problems.